An overly long biopic that is fun when it deals with chaplin the actor and his career, but dull when it deals with chaplin the person and his many wives. Chaplin is the movie about the classic silent film star and his life. It is an absolute biopic, from beginning to end, starting out when the icon was just a boy and staying with him in great detail all the way up until his old age. As if that wasn’t enough to make for a nice, long film, the movie is told in flashback with Chaplin the old man sitting on a porch overlooking an open field, telling his story to news reporter Anthony Hopkins. He’s reflecting on his life and on how he felt about things at the time, and we are there, like Hopkins, to catch every word he says. It gets a little tiresome after a while. The first quarter or so of the movie is great. That’s when we really get into the history of America at the time and how the film industry was filled with silent comedians. We see Charlie entertain a crowd as a young boy and then make a talent scout laugh, who comes to see him at the request of his brother. Soon, Charlie is performing for a large stage audience; only he’s doing it by pretending to be a member of the crowd. He dresses as a drunk, with a face that is red from all the alcohol, and tries to take his seat in when of the side boxes overlooking the stage. He is unsuccessful and keeps falling all over the place. This happens as the announcer is trying to talk to the crowd about the next performance and the announcer ends up going over to Chaplin’s booth and having it out with him. This is how Chaplin begins to get his name out there. Well, one of the people who were in the audience to see him was a silent filmmaker, played by Dan Akyroyd, who wants to hire this man for his movies. He sends a telegram to Chaplin offering a large salary if the performer will come out to California and work for him. And so Chaplin does. Only when he gets out there, akyroyd doesn’t believe it’s the same guy he saw on stage. This guy Chaplin looks like he has things together and the man on stage looked much older and acted much clumsier. Chaplin does a little act, right then and there, in front of the crew that is making another movie, and he falls all over the place to prove that he is the guy akyroyd saw. It works and he gets the gig. All of this is great. So is what comes next, which is a real vision into the early film industry, with a lot of improvising as Chaplin does whatever he thinks of in that moment, and the director shouting out to the rest of the cast from behind the camera. We watch as a whole movie scene gets put together, with Chaplin interrupting a wedding shoot in a house, then being chased around the staircase, and eventually finding the chance to steal the bride to be away for a private moment. This guy Chaplin is not only funny, but he’s a romantic too. At this point, Chaplin is becoming a name in the film industry. His brother flies in to California to represent him as his agent, and the two of them demand more from Akyroyd. Chaplin wants to write and direct his own movies. Akyroyd isn’t too thrilled about this, and the two of them go their separate ways. 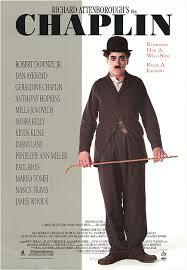 But not before Chaplin can have it out with anybody’s wife, played by Marissa Tomei. Chaplin doesn’t respect her and she’s got a problem with that. It’s a sign of things to come, as the movie will be taking us through many other women who Chaplin carried on relationships or affairs with, but ended up treating them so poorly that they walked out on him. As Chaplin leaves akyroyd and the studio with him behind, the movie is about 30 minutes or so in, and it is already starting to go downhill. Everything so far has been great, but now we are ready to see the opposite side of all of the success. Chaplin really does go through one woman after another. Big name movie stars, such as Penelope Anne Miller, Mila Jovovich, Diane Lane, and Nancy Travis, often play them. And the problem is that they come and go so quickly that sometimes we are not even sure where they began and where they ended. I suppose that’s a little like what Chaplin was going through at the time and what he was feeling, but for us it is just confusing. The movie gets fun again in the moments that don’t deal with these women. For example, we meet Douglas Fairbanks, star of the thief of Bagdad and another silent films. He was more of an exotic adventure star than Chaplin, acting in movies of fantasy and swashbuckling action. I suppose he was the first action star of film whereas Chaplin was more of a slapstick comedian. Fairbanks (played by Kevin Kline) was one of Chaplin’s friends, and so I understand why his character is in this movie. What I don’t understand is why there is never even a mention of Buster Keaton, who was Chaplin’s rival. Keaton was the other slapstick, silent film star at the time, he did something in between what Chaplin, and Fairbanks did. Chaplin was the romantic, Fairbanks was the fantasy star, and Keaton was more of a realistic action movie star. He played detectives, train conductors, and other roles like those. But in this movie, his character is nowhere to be found and that includes even being mentioned. It’s nice to see Fairbanks, a recognizable celebrity, being brought to life in this movie, and the same could be said of J. Edgar Hoover, who apparently did not get along with Chaplin at all. The two of them go to a dinner party with a number of other people and while they’re sitting at the table, Hoover starts talking about how it’s so terrible what Chaplin is doing, and Chaplin just plays around with rolls of bread, trying to make people laugh. It’s a comical scene, and it shows why the two of these men became enemies. Hoover wanted Chaplin to take responsibility for his films and Chaplin retaliated by making Hoover look like a fool. As the movie goes on it gets into both World War II and then the red scare of communism in America and the hearings of Senator Joseph McCarthy. It almost becomes a history film. I understand that these world events played an important part in Chaplin’s life and in what were going on at the time, but at a certain point it’s just too much for one movie. Chaplin was not Jewish, but he certainly made fun of Hitler and had problems with Nazi’s or Nazi supporters whenever he came in contact with them. The same can be said of his dealings with people who wanted to persecute others for possibly having affiliations with the communist party. Chaplin is a movie with a lot going on. So much so that it’s hard to keep track of everything and often we don’t even want to try. Everything about his film career is fantastic. 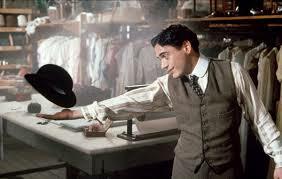 That includes going onto the set of his movie the gold rush, and seeing clips from modern times and city lights. It’s great to hear conversations about the development of the tramp character, or how Chaplin was going to deal with the new “talkies” films that were the future. We even get great conversations surrounding his movie the great dictator, and whether or not he can poke fun at Hitler when America hasn’t really taken a side on the war yet. All of this is very interesting. But the movie is just too long. And that’s because aside from all of the moviemaking and all of the world history, this movie also spends a large amount of time dealing with Chaplin’s many relationships with women. And that’s the part that bogs the movie down. There are too many women and they take up too much of the film. I know this movie really wanted to cover every part of the man’s life and make it feel like his life must have felt, doing justice to each element, but in order to do this, it had to risk losing the audience to boredom. And that’s exactly what happened. Most of the movie is pretty good, but there are certainly a lot of areas where it should have been trimmed in order to pick up speed, momentum, and maintain the audience’s interest.